This great value trip takes you to the best-known icy peaks and creaking glaciers of the area whilst staying in cosy hotels in El Chalten. 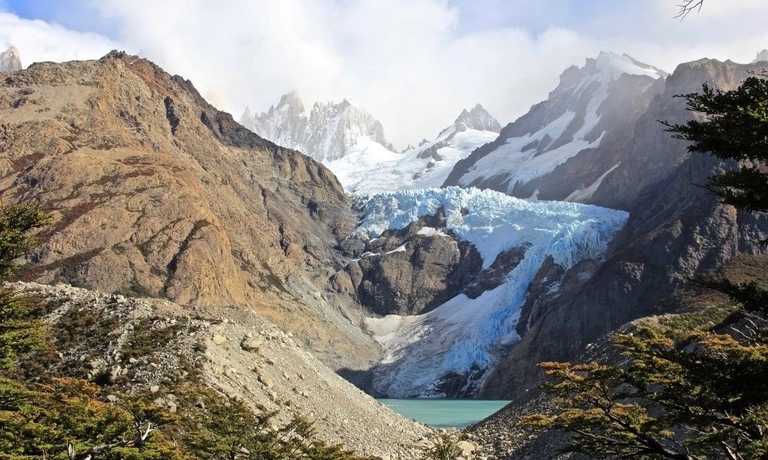 You'll see Cerros Torre and Fitz Roy, pass over the walkways of Perito Moreno glacier, and trek on top of Viedma glacier. Great as an extension to a week in neighbouring Torres del Paine. You will arrive into Calafate for a late lunch. You will be able to leave your bags with the bus company that takes you to Chalten and then go and have a wander/coffee and watch the world go by... Bus leaves for El Chalten at 18.30. The bus journey to Chalten takes 3 hours. On arrival into Chalten you'll be picked up and transferred to your accommodation. You will leave El Chalten, with your guide in a transfer to the trailhead, half an hour away. You then start this lovely walk in a forest path that ascends gently. You walk for a couple of hours through a pretty lenga forest until you arrive at Piedras Blancas Glacier viewpoint. After a break, continue on to Poincenot camp and cross the river on to Rio Blanco campsite. Here is where you start the challenging section of one hour of steep uphill to get to Laguna de los Tres. The effort is all made worth it by the breathtaking views you get at the top, of Mt Fitz Roy and its satellite mountains. From here, go round the lake to have a look at Laguna Sucia and its glacier. Another stunning view! After having lunch with a view you descend down the path and then head towards Laguna Capri, another very photographic spot in the national park. From here you have the last hour of trekking back to El Chalten. The unforgettable experience of ice trekking on a glacier! And not just any glacier, the largest one in Argentina - Perito Moreno. The port is just a short drive away from El Chalten. You then navigate for about 45 minutes across the lake Viedma until you reach the rocky promontory where you disembark in order to visit the glacier. You will then don your crampons and enjoy ice trekking on the glacier, with plenty of time for taking photos and learning all about glaciers and their seracs, sumideros, etc. After an exciting couple of hours you head back to the boat and return to Chalten. The trek from Loma del Pliegue Tumbado to Laguna Torre affords great aerial views of the park. The trek is uphill all the way there and downhill all the way back! This walk is located a bit closer to the steppe than the others, so it has a bit more of a wild feeling. You are also able to get great views of Viedma lake - the largest lake of Argentina. This area used to be the seabed and it's therefore possible to find ammonites and other fossils. If the wind is not too strong you can sit and have lunch with a view of Fitz Roy and Torre and the whole park below you! Return along the same path. The trek to Laguna Torre is a bit gentler - not so much climbing as the day before! You will enjoy this walk along a glacial valley - loved by geologists and photographers for its perfect shape. At the end of the valley you will find the Laguna Torre, its glacier and the famous Mt Torre - one of the most difficult mountains in the world to climb. After lunch at the lagoon you will head back towards Chalten. Catch the 18:30 bus back to Calafate and make your way to your hotel. Today you will be picked up from your hotel and driven the 90km to the Perito Moreno glacier. On the journey there you will have a few photo stops; the views of Lake Argentino and the steppe are fantastic. On the peninsula in front of the glacier is the walkway which affords great views of the glacier face and its calving and a view along the top of the glacier towards its source. You will have time for wandering around and enjoying the views. There is a cafeteria at the glacier for snacks and hot drinks. This trip can run as a group trip, with prices starting from $945 per person for a complete group. If you are looking to join a group or you are a solo traveller we will help to form likeminded groups of travellers. Please let us know your travel plans. Price of USD $945 per person is based on a group of 2 people. Please get in touch for information on departures.